A fifth force may exist that disrupts the predictions general relativity makes outside our own galaxy, on cosmic-length scales. University of Pennsylvania astrophysicist, Bhuvnesh Jain, says the nature of gravity is the question of a lifetime. As scientists have been able to see farther and deeper into the universe, the laws of gravity have been revealed to be under the influence of an unexplained force. Two branches of theories have sprung up, each trying to fill its gaps in a different way. One branch — dark energy — suggests that the vacuum of space has an energy associated with it and that energy causes the observed acceleration. The other falls under the umbrella of “scalar-tensor” gravity theories, which effectively posits a fifth force (beyond gravity, electromagnetism and the strong and weak nuclear forces) that alters gravity on cosmologically large scales. Jain’s research is focused on the latter possibility; he is attempting to characterize the properties of this fifth force that disrupts the predictions general relativity makes outside our own galaxy, on cosmic length scales. By analyzing a well-studied class of stars in nearby galaxies, Jain and his colleagues have produced new findings that narrow down the possibilities of what this force could be. Their findings are a vindication of Einstein’s theory of gravity. Having survived a century of tests in the solar system, it has passed this new test in galaxies beyond our own as well.In 1998, astrophysicists made an observation that turned gravity on its ear: the universe’s rate of expansion is speeding up. If gravity acts the same everywhere, stars and galaxies propelled outward by the Big Bang should continuously slow down, like objects thrown from an explosion do here on Earth. This observation used distant supernovae to show that the expansion of the universe was speeding up rather than slowing down. This indicated that something was missing from physicists’ understanding of how the universe responds to gravity, which is described by Einstein’s theory of general relativity. Jain’s breakthrough came about when he and his colleagues realized they could use the troves of data on a special property of a common type of star as an exquisite test of gravity. Astrophysicists have been pursuing tests of gravity in the cosmos for many years, but conventional tests require data on millions of galaxies. Future observations are expected to provide such enormous datasets in the coming data. But Jain and his colleagues were able to bypass the conventional approach. “We’ve been able to perform a powerful test using just 25 nearby galaxies that is more than a hundred times more stringent than standard cosmological tests,” Jain said.The nearby galaxies are important because they contain stars called cepheids that are bright enough to be seen individually. Moreover, cepheids have been used for decades as a kind of interstellar yardstick because their brightness oscillates in a precise and predictable way. In the image below, the circled star is the Cepheid variable star V1, discovered by the aEdwin Hubble in 1923. The brightness of a Cepheid variable star oscillates with a very regular period, and because the star’s luminosity is directly related to its oscillating period, the distance to the star can be determined fairly accurately. When Hubble calculated the distance to V1, he realised it was too far away for it to be part of our own Milky Way galaxy. 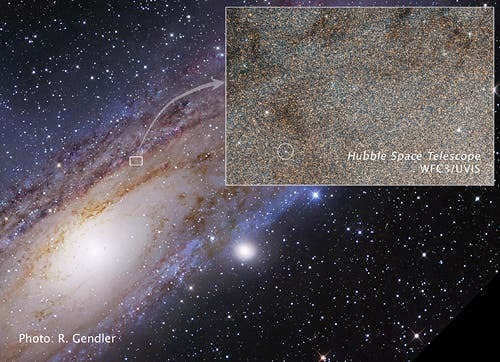 Astronomers had been debating the size of the universe around this time, and Hubble’s discovery proved that the Andromeda Galaxy is a large independent galaxy, not a small nebula within our own galaxy. Cepheids have a unique trait that allows astrophysicists to get this critical information: their luminosity oscillates over the course of days and weeks. The known relationship between a cepheid’s rate of oscillation and intrinsic brightness serves as that baseline for calculating its distance from Earth, which in turn serves as a baseline for calculating the distance of other celestial objects. Because of their usefulness, there was already more than a decade of data on cepheids based on the Hubble Space Telescope and other large telescopes in Chile and Hawaii. Using that data, Jain and his colleagues compared nearly a thousand stars in 25 galaxies. This allowed them to make comparisons between galaxies that are theoretically “screened” or protected from the effects of the hypothetical fifth force and those that are not. 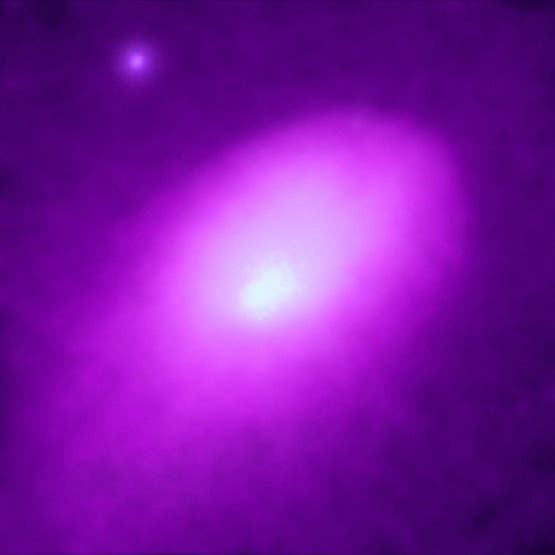 Larger galaxies and ones that belong to galaxy clusters are screened, while smaller, isolated galaxies are not. Jain and his colleagues ultimately did not see variation between their control sample of screened galaxies and their test sample of unscreened ones. Their results line up exactly with the prediction of Einstein’s general relativity. This means that the potential range and strength of the fifth force is severely constrained. “We find consistency with Einstein’s theory of gravity and we sharply narrow the space available to these other theories. Many of these theories are now ruled out by the data,” Jain said.With better data on nearby galaxies in the coming years, Jain expects that an entire class of gravity theories could essentially be eliminated. But there remains the exciting possibility that better data may reveal small deviations from Einstein’s gravity, one of the most famous scientific theories of all time. In the image at the top of the page, the bright source in the upper left is an active galaxy in the cluster, Abell 2142, six million light years across that contains hundreds of galaxies and enough gas to make a thousand more. It is one of the most massive objects in the universe. The Hubble Effect's 25th Anniversary –"A Radical Transformation of Our Perception of the Universe"